This mixture of % and fixed pixels corrupts the display on small screens, and wastes space on large screen. Please remove the "4 hours ago" on the right side, and this allows for a nice: 20% (feed title) 80% (article title) layout. This keeps all titles properly justified, and using all available space, at all screen sizes. 1) I think this section is useless, selected feed easily can be seen in subscriptions tree. Plus this dark bubbles kinda distract a little bit. 3) This icon looks like list items is blended together, don't know if it's bug or not. I determine which posts to read by their read/unread status but I have a number of feeds which I don't need to read very often - I tend to let them accumulate and then browse through picking out the interesting stories. This means that my 'unread' total grows when, in fact, I have read everything that is currently interesting. If I could set these feeds to import as already read, I would still know that they were there and go and check them periodically and my 'unread posts' would actually be the ones that I am interested in checking as they appear. A clear reason to switch from Google Reader to The Old Reader would be if it were not just familiar but actually better than its predecessor. Therefore I suggest you allow at least 3 months worth of feed items. Google Reader allowed only one month and it was often a major pain. When I open The Old Reader, the scroll bar for the subscriptions is hidden "under" the add subscription box. I have to close my uppermost folder to get it to appear. Once it appears, it doesn't disappear, even when moved all the way to the top or when that folder is reopened (which is good). I don't know if this has anything to do with my having a lot of folders and subscriptions or needed a rather large font. It's not a big problem, but I'd appreciate it if you fixed this. Thx. Are you planning a new theme and interface because I really think the actual one need some refreshment ! It has not been updated since a long time and I feel less and less confortable with it. 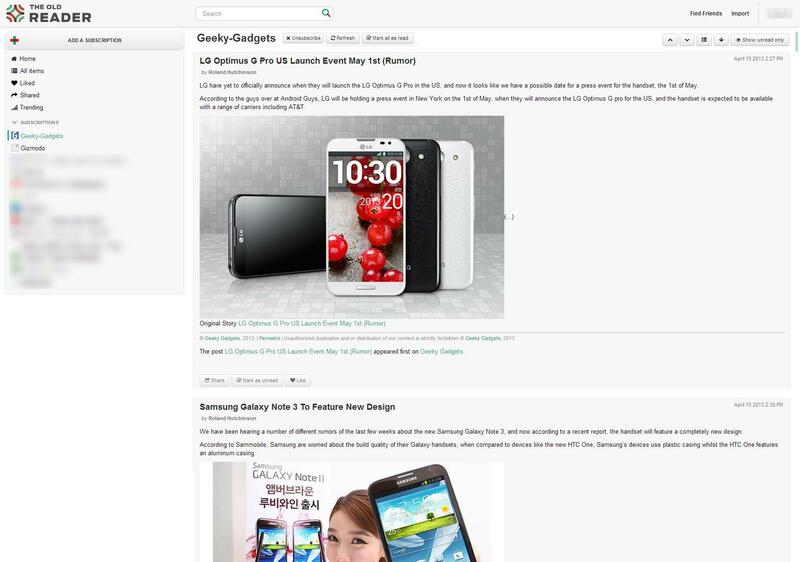 You should think about updating it, feel free to inspire yourself from inoreader and feedly. I don't want the same theme as your concurrent but a theme/interface more pleasant to use :-) Hope you understand. Currently searching functionality in Japanese does not work properly. For example, Search with the keyword '東京'(Tokyo), the search result shows the feeds which contain any of '東' or '京'. Please improve this functionality to get correct search result. Allow unread items to be sorted oldest first, and started items as newest first. I can barely use TOR from my Android phone (4.1.2) from the Browser AND Firefox for Android 21. After a server error or randomly when performing any action, I will be either stuck on the Home screen, or I will be logged out. I do not experience this from Win 7 Firefox 21... well maybe rarely. There is a line that says "Name1, Name2 likes this" with names in red, under posts. I would like to hide it. Your interface is a usability nightmare. That green scroll bar only becomes visible on hover, so I spend much of my time hovering up and down trying to find it, and then it's so small it's hugely difficult to click on. What's worse, why isn't there a way to scroll with the keyboard?! highlight the mobile web on your website. 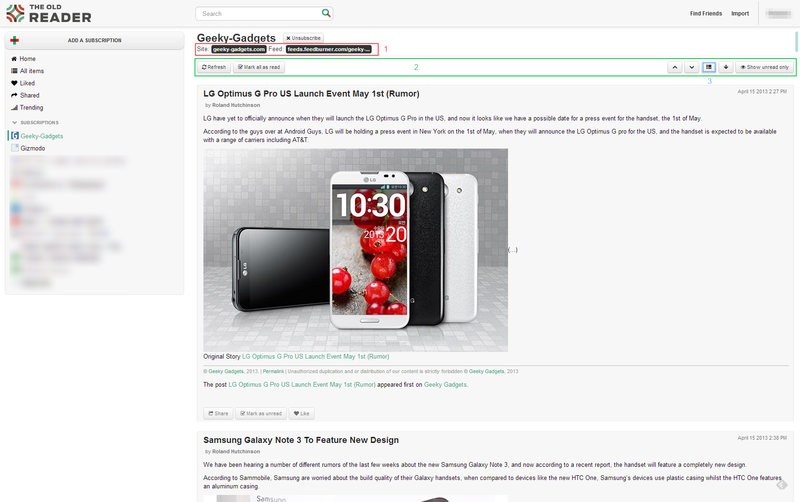 I'm a Google Reader refugee and I really like what I see in The Old Reader! Many people are looking for a mobile app and don't seem to realize that the mobile web version is excellent! I suggest you highlight this for new users as a way to satisfy those folks. Just add a shortcut button that goes to the web page and presto, no need for a native app. Many people seem to want an app for everything, when many apps just a the browser internally.